Paul remained overshadowed by his mother for much of his life. His reign lasted five years, ending with his assassination by conspirators. His most important achievement was the adoption of the laws of succession to the Russian throne - rules that lasted until the end of the Romanov dynasty and of the Russian Empire. He became de facto Grand Master of the Order of Hospitallers, and ordered the construction of a number of Maltese thrones (as of 2016 on display in the State Hermitage Museum, Gatchina Palace and the Kremlin Armoury). During his infancy, Paul was taken immediately from his mother by the Empress Elizabeth, whose overwhelming attention may have done him more harm than good. As a boy, he was reported to be intelligent and good-looking. His pug-nosed facial features in later life are attributed to an attack of typhus, from which he suffered in 1771. Some claim that his mother Catherine hated him, and was restrained from putting him to death. Massie is more compassionate towards Catherine; in his 2011 biography of her he claims that once Catherine had done her duty in providing an heir to the throne Elizabeth had no more use for her, and Paul was taken from his mother at birth and withheld from her presence except during very limited moments. Paul was put in the charge of a trustworthy governor, Nikita Ivanovich Panin, and of competent tutors. It is interesting to note that Panin's nephew went on to become one of Paul's assassins. 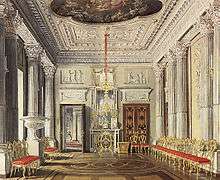 The Russian Imperial court, first of Elizabeth and then of Catherine, was not an ideal home for a lonely, needy and often sickly boy. However, Catherine took great trouble to arrange his first marriage with Wilhelmina Louise (who acquired the Russian name "Natalia Alexeievna"), one of the daughters of Ludwig IX, Landgrave of Hesse-Darmstadt, in 1773, and allowed him to attend the Council in order that he might be trained for his work as Emperor. His tutor, Poroshin, complained that he was "always in a hurry", acting and speaking without reflection. After Paul's first wife died in childbirth, his mother arranged another marriage on 7 October 1776, with the beautiful Sophia Dorothea of Württemberg, who received the new Orthodox name Maria Feodorovna. The use made of his name by the rebel Yemelyan Pugachev, who impersonated his father Peter, tended no doubt to render Paul's position more difficult. 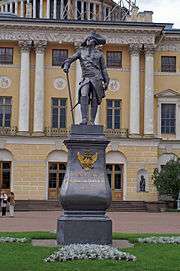 On the birth of his first child in 1777 the Empress gave him an estate, Pavlovsk. Paul and his wife gained leave to travel through western Europe in 1781–1782. 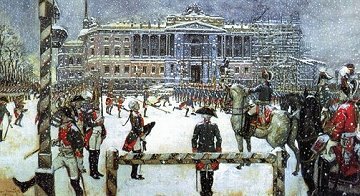 In 1783 the Empress granted him another estate at Gatchina, where he was allowed to maintain a brigade of soldiers whom he drilled on the Prussian model, an unpopular stance at the time. Catherine the Great and her son and heir, the future Paul I, maintained a distant relationship throughout the reign of the former. The aunt of Catherine's husband, Empress Elizabeth, took up the child as a passing fancy. :28 Elizabeth proved an obsessive but incapable caretaker, as she had raised no children of her own. Paul was supervised by a variety of caregivers. Roderick McGrew briefly relates the neglect to which the infant heir was sometimes subject: "On one occasion he fell out of his crib and slept the night away unnoticed on the floor. ":30 Even after Elizabeth's death, relations with Catherine hardly improved. Paul was often jealous of the favors she would shower upon her lovers. In one instance the empress gave to one of her court favourites fifty-thousand rubles on her birthday, while Paul received a cheap watch. Paul's early isolation from his mother created a distance between them which later events would reinforce. She never considered inviting him to share her power in governing Russia. And once Paul's son Alexander was born, it appeared that she had found a more suitable heir. Catherine's absolute power and the delicate balance of courtier-status greatly influenced the relationship at Court with Paul, who openly disregarded his mother's opinions. Paul adamantly protested his mother’s policies, writing a veiled criticism in his Reflections, a dissertation on military reform. In it he directly disparaged expansionist warfare in favour of a more defensive military policy. Unenthusiastically received by his mother, Reflections appeared a threat to her authority and added weight to her suspicion of an internal conspiracy with Paul at its center. For a courtier to have openly supported or shown intimacy towards Paul, especially following this publication, would have meant political suicide. 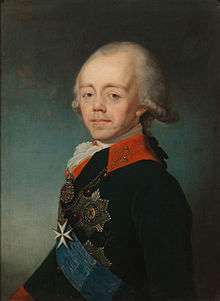 Paul spent the following years away from the Imperial Court, contented to remain at his private estates at Gatchina with his growing family and to perform Prussian drill-exercises. 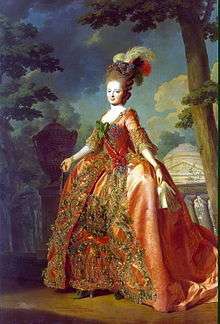 As Catherine II grew older she became less concerned that her son attend court functions; her attentions focused primarily on Paul's son, the future Emperor Alexander I. 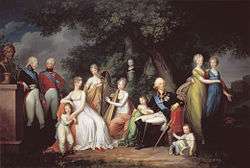 It was not until 1787 that Catherine II may have in fact decided to exclude her son from succession. :184 After Paul's sons Alexander and Constantine were born, she immediately had them placed under her charge, just as Elizabeth had done with Paul. That Catherine grew to favour Alexander as sovereign of Russia rather than Paul is unsurprising. She met secretly with Alexander’s tutor de La Harpe to discuss his pupil's ascension, and attempted to convince Maria, his mother, to sign a proposal authorizing her son's legitimacy. Both efforts proved fruitless, and though Alexander agreed to his grandmother's wishes, he remained respectful of his father's position as immediate successor to the Russian throne. Emperor Paul was idealistic and capable of great generosity, but he was also mercurial and capable of vindictiveness. In spite of doubts of his legitimacy, he greatly resembled his father, Peter III and other Romanovs as well and shared the same character. Catherine the Great was not a Romanov blood but instead of Rurik descent. During the first year of his reign, Paul emphatically reversed many of the harsh policies of his mother. Although he accused many of Jacobinism, he allowed Catherine's best known critic, Radishchev, to return from Siberian exile. Along with Radishchev, he liberated Novikov from Schlüsselburg fortress, and also Tadeusz Kościuszko, yet after liberation both were confined to their own estates under police supervision. He viewed the Russian nobility as decadent and corrupt, and was determined to transform them into a disciplined, principled, loyal caste resembling a medieval chivalric order. To those few who conformed to his view of a modern-day knight (e.g., his favourites Kutuzov, Arakcheyev, Rostopchin) he granted more serfs during the five years of his reign than his mother had presented to her lovers during her thirty-four years. Those who did not share his chivalric views were dismissed or lost their places at court: seven field marshals and 333 generals fell into this category. For this, Paul is sometimes regarded as a sympathizer of the Polish people due to his deep respect for them. Paul made several idiosyncratic and deeply unpopular attempts to reform the army. Under Catherine's reign, Grigori Potemkin introduced new uniforms that were cheap, comfortable and practical, and designed in a distinctly Russian style. Paul decided to fulfill his predecessor Peter III's intention of introducing Prussian uniforms. Impractical for active duty, these were deeply unpopular with the men, as was the effort required to maintain them. His love of parades and ceremony was not well-liked either. He ordered that Wachtparad (Watch parades) take place early every morning in the parade ground of the palace, regardless of the weather conditions. He would personally sentence soldiers to be flogged if they made a mistake, and at one point ordered his guards regiment to literally march to Siberia after they became disordered during manoeuvers, although he changed his mind after they walked about 10 miles. He attempted to reform the organization of the army in 1796 by introducing The Infantry Codes; a series of guidelines that based the organization of the army largely upon show and glamour, but his greatest commander, Suvorov, completely ignored them, believing them to be worthless. At a great expense, he built three castles in or around the Russian capital. Much was made of his courtly love affair with Anna Lopukhina. Emperor Paul also ordered the bones of Grigory Potemkin, one of his mother's lovers, dug out of their grave and scattered. In June 1798, Napoleon seized Malta; this greatly offended Paul. :51 In September, the Priory of St. Petersburg declared that Grand Master Hompesch had betrayed the Order by selling Malta to Napoleon. A month later the Priory elected Paul Grand Master. :55–58 This election resulted in the establishment of the Russian tradition of the Knights Hospitaller within the Imperial Orders of Russia. The election of the sovereign of an Orthodox nation as the head of a Catholic order was controversial, and it was some time before the Holy See or any of the other of the Order's priories approved it. This delay created political issues between Paul, who insisted on defending his legitimacy, and the priories’ respective countries. :59 Though recognition of Paul’s election would become a more divisive issue later in his reign, the election immediately gave Paul, as Grand Master of the Order, another reason to fight the French Republic: to reclaim the Order’s ancestral home. The most original aspect of Paul I’s foreign policy was his rapprochement with France after the coalition fell apart. Several scholars have argued that this change in position, radical though it seemed, made sense, as Bonaparte became First Consul and made France a more conservative state, consistent with Paul’s view of the world. Even Paul's decision to send a Cossack army to take British India, bizarre as it may seem, makes a certain amount of sense: Britain itself was almost impervious to direct attack, being an island nation with a formidable navy, but the British had left India largely unguarded and would have great difficulty staving off a force that came over land to attack it. The British themselves considered this enough of a problem that they signed three treaties with Persia, in 1801, 1809 and 1812, to guard against an army attacking India through Central Asia. Paul sought to attack the British where they were weakest: through their commerce and their colonies. Throughout his reign, his policies focused reestablishing peace and the balance of power in Europe, while supporting autocracy and old monarchies, without seeking to expand Russia's borders. In spite of Russia's failure to honour the terms of the Treaty of Georgievsk, as Qajar Iran reinvaded Georgia and captured and sacked Tbilisi, Georgian rulers felt they had nowhere else to turn now that Georgia was again re-subjugated by Iran. Tbilisi was captured and burnt to the ground, and eastern Georgia reconquered. Agha Mohammad Khan however, Persia's ruler, was assassinated in 1797 in Shusha, after which the Persian grip on Georgia softened once again. Erekle however, still dreaming of a united Georgia, died a year afterwards. After Erekle's death, a civil war broke out over the succession to the throne of Kartli-Kakheti and one of the rival candidates called on Russia to intervene and decide matters. On 8 January 1801, Tsar Paul I signed a decree on the incorporation of Georgia (Kartli-Kakheti) within the Russian Empire which was confirmed by Tsar Alexander I on 12 September 1801. The Georgian envoy in Saint Petersburg, Garsevan Chavchavadze, reacted with a note of protest that was presented to the Russian vice-chancellor Alexander Kurakin. 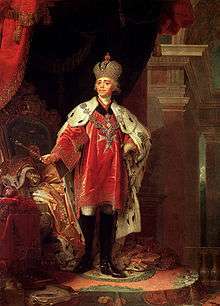 In May 1801, Russian General Carl Heinrich von Knorring removed the Georgian heir to the throne, David Batonishvili, from power and deployed a provisional government headed by General Ivan Petrovich Lazarev. Some of the Georgian nobility did not accept the decree until April 1802, when General Knorring held the nobility in Tbilisi's Sioni Cathedral and forced them to take an oath on the imperial crown of Russia. Those who disagreed were arrested. Wanting to secure the northernmost reaches of his empire, as well as knowing that the grip on Georgia was drastically loosening with Russia's formal entrance into Tbilisi, Agha Mohammad Khan's successor, Fath Ali Shah Qajar got involved into the Russo-Persian War (1804-1813). In the summer of 1805, Russian troops on the Askerani River and near Zagam defeated the Persian army, saving Tbilisi from its attack and re-subjugation. In 1810, the kingdom of Imereti (Western Georgia) was annexed by the Russian Empire after the suppression of King Solomon II's resistance. In 1813, Qajar Iran was officially forced to cede Georgia to Russia per the Treaty of Gulistan of 1813. This marked the official start of the Russian period in Georgia. Paul's premonitions of assassination were well-founded. His attempts to force the nobility to adopt a code of chivalry alienated many of his trusted advisors. The Emperor also discovered outrageous machinations and corruption in the Russian treasury. Although he repealed Catherine's law which allowed the corporal punishment of the free classes and directed reforms which resulted in greater rights for the peasantry, and better treatment for serfs on agricultural estates, most of his policies were viewed as a great annoyance to the noble class and induced his enemies to work out a plan of action. A conspiracy was organized, some months before it was executed, by Counts Peter Ludwig von der Pahlen, Nikita Petrovich Panin, and the half-Spanish, half-Neapolitan adventurer Admiral Ribas. The death of Ribas delayed the execution. On the night of 23 March [O.S. 11 March] 1801, Paul was murdered in his bedroom in the newly built St Michael's Castle by a band of dismissed officers headed by General Bennigsen, a Hanoverian in the Russian service, and General Yashvil, a Georgian. They charged into his bedroom, flushed with drink after supping together, and found Paul hiding behind some drapes in the corner. The conspirators pulled him out, forced him to the table, and tried to compel him to sign his abdication. Paul offered some resistance, and one of the assassins struck him with a sword, after which he was strangled and trampled to death. He was succeeded by his son, the 23-year-old Alexander I, who was actually in the palace, and to whom General Nikolay Zubov, one of the assassins, announced his accession, accompanied by the admonition, "Time to grow up! Go and rule!" In 1906 Dmitry Merezhkovsky published his tragedy "Paul I". Its most prominent performance was made on the Soviet Army Theatre's stage in 1989, with Oleg Borisov as Paul. A film about Paul's rule was produced by Lenfilm in 2003. Poor, Poor Paul (Бедный бедный Павел) is directed by Vitaliy Mel'nikov and stars Viktor Sukhorukov as Paul and Oleg Yankovsky as Count Pahlen, who headed a conspiracy against him. The film portrays Paul more compassionately than the long-existing stories about him. The movie won the Michael Tariverdiev Prize for best music to a film at the Open Russian Film Festival "Kinotavr" in 2003. Constantine, Emperor of Russia 27 April 1779 15 June 1831 married first Juliane, Princess of Saxe-Coburg-Saalfeld (Anna Feodorovna), married second Countess Joanna Grudzińska morganatically. He had with Joanna one child, Charles (b. 1821) and 3 illegitimate children: Paul Alexandrov from first relationship; Constantine Constantinovich and Constance Constantinovna from second relationship. Grand Duchess Catherine Pavlovna 21 May 1788 9 January 1819 married Georg, Duke of Oldenburg (1784–1812), had two sons; married Wilhelm I, King of Württemberg (1781–1864), and had two daughters. ↑ Zagare, Liena (2005-08-18). "Dangerous Liaisons". Arts+. The New York Sun. p. 15. Retrieved 2016-02-17. [...] it is very strongly suggested, that the later Romanovs were not, in fact, Romanovs. ↑ "Мальтийский орден". 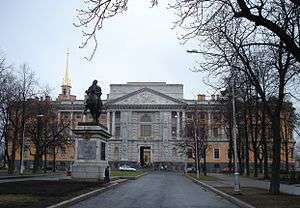 Encyclopaedia of Saint Petersburg. ↑ Farquhar, Michael (2001). A Treasure of Royal Scandals, p.192. Penguin Books, New York. ISBN 0-7394-2025-9. ↑ For the Iranian expedition, see Haukeil, 349. For the 60,000 troops to Europe, see McGrew (1992), 282. ↑ "History After Malta". Spirituallysmart.com. Retrieved 2013-09-12. ↑ For Archduke Charles withdrawing early, see McGrew (1992), 301. For more information on the battles Korsakov and Suvorov fought, see Haukeil, 361–62. ↑ For a summary of the taking of Ancona, see McGrew (1992), 306. For a quick summary of all the issues involved, see Hugh Ragsdale, "A Continental System in 1801: Paul I and Bonaparte," The Journal of Modern History, 42 (1970), 70–71. ↑ For a summary of the Netherlands campaign, see McGrew (1992), 309. For a more detailed look at the events, with a slight British bias, see Haukeil, 364. ↑ For a summary, with more information on Paul growing closer to the Baltic states, see McGrew (1992), 311–12. For information on the British ambassador and their choice of Austria over Russia, see Ragsdale, "A Continental System in 1801: Paul I and Bonaparte," The Journal of Modern History, 71–72. For Napoleon's actions and Paul's feelings towards him, see Haukeil, 365. ↑ For information on the Danish frigate, see Hugh Ragsdale, "Was Paul Bonaparte's Fool? : The Evidence of Neglected Archives," in Paul I: A Reassessment of His Life and Reign, ed. Hugh Ragsdale (Pittsburgh: University Center for International Studies, University of Pittsburgh, 1979), 80. For Paul's reaction to the seizure and then the events at Malta, see McGrew (1992), 313–14. For the date of the Maltese events, and a more English view of them, see Haukeil, 366. ↑ For a summary of Paul's reaction, see McGrew (1992), 314. For more details, see Haukeil, 366. ↑ For information on the military side of these measures, see McGrew (1992), 314. For information on the economic side and how Paul interacted with the Armed Neutrality, see Ragsdale, "Was Paul Bonaparte's Fool?" in Paul I: A Reassessment of His Life and Reign, 81. ↑ Ragsdale, "A Continental System in 1801: Paul I and Bonaparte," The Journal of Modern History, 81–82. ↑ For arguments about consistency and Paul's reasons to fight, see McGrew (1992), 318. For the arguments as to why Paul was willing to reach an agreement with Bonaparte, see Muriel Atkin, "The Pragmatic Diplomacy of Paul I: Russia's Relations with Asia, 1796–1801," Slavic Review, 38 (1979), 68. ↑ Atkin, "The Pragmatic Diplomacy of Paul I," 68. ↑ While the british were signing treaties with persia to protect their holding in India in the late 18th century Paul I was working with the kingdom of Georgia and made them a protectorate of the russian empire in 1768 and then in 1801 Georgia was attacked by iranian forces. This attack would push Paul I to take further steps beyond what was in place in order to protect his interests in the caucasus. Paul I intended to annex the kingdom but he was assassinated before he could finish the decree but Alexander I, Paul I's successor, would finish the deal and provide full protection Atkin, "The Pragmatic Diplomacy of Paul I," 69. ↑ Ragsdale, "Was Paul Bonaparte's Fool?" in Paul I: A Reassessment of His Life and Reign, 88. ↑ Alexander II, The last great tsar, by Edvard Radzinsky. Page 16–17. Freepress, 2005. ↑ Zhevakhov, Prince N. D. (1993) Reminiscences, V.2, p.273. Moscow. 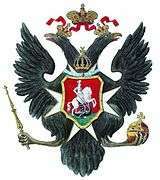 ↑ "Royal Russia - The Romanov Dynasty: The Grand Dukes of Russia". Angelfire.com. Retrieved 2013-09-12. This article incorporates text from a publication now in the public domain: Chisholm, Hugh, ed. (1911). "Paul I.". Encyclopædia Britannica. 20 (11th ed.). Cambridge University Press. Gilman, D. C.; Thurston, H. T.; Colby, F. M., eds. (1905). "Paul I., Petrovitch". New International Encyclopedia (1st ed.). New York: Dodd, Mead.